Heat oven to 375°F. In large bowl, combine ground beef, bread crumbs, 1/2 cup of the pizza sauce and egg; mix well. Divide mixture evenly into 8 ungreased muffin cups. Pat in bottom and up sides of cups to form beef cups. Fill cups with olives and cheese. Bake at 375°F. for 15 to 20 minutes or until beef is thoroughly cooked. Meanwhile, heat remaining pizza sauce; serve with meat cups. Small individual meat cups bake faster than one large meatloaf. This recipe puts dinner on the table more quickly than if a traditional meatloaf recipe were used. Prepare these meat cups one day ahead of time. Cover and refrigerate them. Uncover and bake meat cups, adding 3 to 5 minutes to baking time. 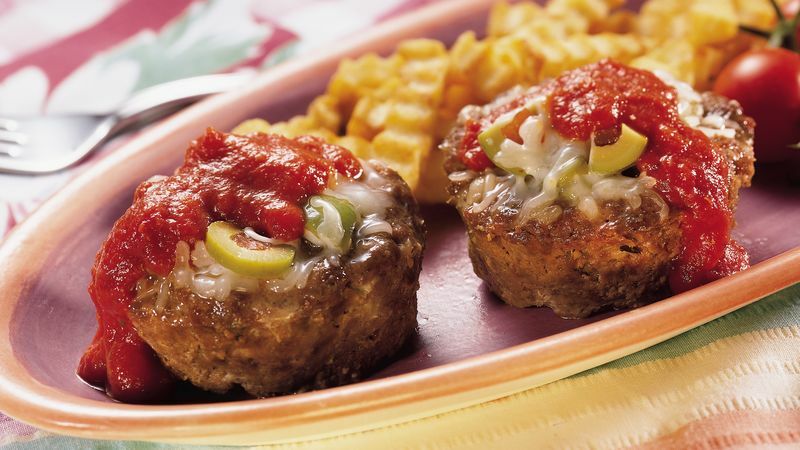 Serve these meat cups with french fries, cherry tomatoes and lemonade.